I'm sorry science fiction fans, for me Ender's Game was only OK. I've finished the book some time ago but couldn't decide how I felt about it. There were lines, pages when I thought I'll just put it aside and let it go and other time I thought Hmm, oh wow, that's interesting point. It's been really long time since any book brought such contradictory thoughts. Ender is a 6-year-old genius who is chosen to be world saver in upcoming war with aliens. The boy is taken from his family house to Battle School where he is trained hard beyond his possibilities. Ender is the best so he's also hated by other children, he struggles with other boys who bully and intimidate him. In those critical situations Ender reveals his dark side which is in odds with his inner feelings and leads to frustration and fear of becoming a monster, a sadist, a murderer, like his older brother. I felt really sorry for Ender but at the same time I just couldn't grab the connection with him as he didn't sound like a child, like a 6-year-old boy. It confused me and made me think of him as of total stranger and not character I'm bonded with. Battle School brought Ender's many enemies and few friends with whom he trains. The description of battles and trainings were great and this part I really enjoyed. But what the Game is really about? The story quite depressing and full of manipulations. Nothing seemed as it looked like, the adults in school were boys' guides, mentors and enemies at the same time. Not to mention the children who are quite terrifying with their big brains and deadly thoughts (there were moments where I thought of Lord of the flies). 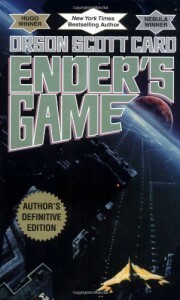 Ender's Game has also a political aspect in which Ender's siblings pull the strings via net and false identities who are active in top world discussion panels. Thanks to their genius tactics they can influence the political and economic directions the world is heading. And this is the part which was the least interesting for me, it's just not my cup of tea. Like the whole science fiction, I'm afraid. But then again, no one is perfect and not everyone needs to like everything.